I am awake. There seem to be commuters heading to work down the canyon. The cars driving by woke me up. It's still dark, but not as dark as it was. It was invisible hand in front of the face dark. It's not that anymore. I get up and get dressed, tidy up the room. A couple of other hikers showed up later last night but I still have my own room. I go out to the kitchen and make my granola. The last bit from my previous resupply. I use the dehydrated nonfat milk above the refrigerator because I'm out of instant breakfast. Well, not out, I have three but I'll need them for the next leg. I pour water into a clean mug and pour my Starbucks caffe mocha via into the water. Then I slide it into the microwave and set it to three minutes. It's an oldish looking microwave. Three minutes is just a guess. I sit at the kitchen table and pull out the Yogi’s guide to the CDT (Continental Divide Trail) that I was looking at last night. Brutal is the most common word used in the guide. I crunch on my granola slowly turning the pages. I'm pretty sure hiking the CDT is not in my future. I check my coffee, it's bubbling but not overflowing. I stir it but it seems that microwaves and Starbucks vias are not fully compatible. At least not the way I did it. It's drinkable but not right. Brenda told me to have my pack in the back of the truck by six if I want a shuttle to the trail at six. I have it in there at five forty five. Let's do this thing. It's about forty two hundred vertical feet and about thirteen miles all uphill. The first part has no shade so I hope to hike it before the sun peeks over the mountains. Brenda’s prompt and I'm in front of the resort where she picked me up at six o’six. The trail passes a stamp mill from the hard rock gold mining days. I stare at it for a few minutes trying to imagine what that thing sounded like. I'm guessing it made quite a racket. The trail is grassy and poison oaky. Star thistles line the tread. It's that type of trail that looks hot even when it's not. The difference between the trail down yesterday and this one going up today is this one has minimal switchbacks. It just follows a ridge, up, and up, and up. For miles and miles, which means hours and hours. It's cool in the shade on the trail that would be unbearably hot in the sun. I climb without needing to drink much water. I watch the sun light slowly creep down the other side of the canyon while also looking ahead to where the trees start. I must get there before the sun gets here. I keep moving up, always up. This part of the mountain burned sometime in the past and blackened snags pointing their bony fingers into the sky are the tree like things around. The bushes crowd in underneath them. They crowd the trail. I have to push them out of the way or go around. I am trying to move quickly so I have a split second to decide if the bush is poison oak or not. Always go around the poison oak. I make it to the trees but that doesn't mean anything except I won't get fried while climbing. The shade is great. I still have to climb. On and on it goes. I don't want to climb anymore. I don't have any choice. It's climb or turn back, I choose climb. I guess that is a choice. I eat snacks. I eat more snacks. I stop for water and drink that. Climbing is boring. This forest is boring. I hate climbing. I hear water below, it's too far to climb down to it but it sounds substantial. The trail takes a sudden turn and I am going down and around. There is a washed out section with a trail to bypass it. It is not to the same standard as the normal PCT. I am bushwhacking through high bushes. The trail meanders down to a ford. I have to cross the raging torrent on slippery logs and rocks. I slip, twice. My feet are wet. Really? Still? I don't want to have wet feet. The trail now starts climbing back up. More bushes, more wacking. It's exhausting having to move the bushes with my arms. They are not used to all this work. They are used to hanging around all day while my legs do all the work. Where is the top? Maybe there is no top, it goes on forever. Maybe I've been climbing this forever. The map says it goes up to a meadow then doglegs to the right. Climb on. Up higher, a quick view of where I've come from then a meadow. Could this be the meadow? I hope it's the meadow. What if it's not the meadow? I cross the meadow, it certainly could be, I think it is. Big right turn! More climbing, up and more up, at least I'm making progress. I climb and climb and suddenly, there is no more climbing. The mountain disappeared, the ground just falls away steeply. A sharp ridge, a clear demarcation. I follow it for a while then the trail turns left and drops over the top. Down, blessed down. I have to figure out how to make these other muscles in my legs work. I look out, north, there is Mt Lassen, trees, lots of trees between here and there. The big hill is behind me. The Sierras are behind me. This forest looks different. This is Cascade forest. Large volcanic outcroppings for the landscape. Lake Almanor sparkles blue way off to the northeast. So this is where this forest starts. Right at this ridge. A couple hundred feet of downhill switchbacks and I'm in a wonderful forest. Purple and blue flowers everywhere under the trees. A carpet of flowers. The trail is red dirt. The forest is open and easy to travel in. It's like walking in a park. Thirteen hundred miles! I reach that marker. Wow! Really? Amazing! I thought it wouldn't hurt to hike when I got this far. I find it still does. It just takes longer to reach that point. I've eaten all my snacks climbing the hill. I still want to go about ten more miles. I reach Cold Spring. There are other thru-hikers here. A total of six of us. The water gushes out of a two inch galvanized pipe. The pipe loops up and around and the water pours straight down. Ice cold, clear, refreshing. I take one and a half liters for hiking and one liter to filter and drink now while it's ice cold. I sit and eat a peanut butter tortilla and a piece of cheese. My last food until dinner time. Another eight miles and I will camp, that will make a twenty five mile day for me. Plenty of miles for today. Everyone leaves except me, eating my tortilla and drinking ice cold water. I am so glad I am now carrying the microfilter. I really enjoy being able to drink ice cold water from springs and streams immediately. The trail meanders up and down and from left to right but gone are the stiff long climbs and switchbacks. I feel like I can walk in this kind of forest on this kind of trail forever. It seems so easy. On and on I go. I start to lag, without energy to keep the engine going I'm slowing down. I am about a mile from where I hope to camp. I see the other hikers. They are sitting in camp chairs. There's an umbrella on a stand. A table. A guy who might, no, is a trail angel. Trail Magic! Completely unexpected and in a remote place a dirt road up on the top of a ridge, just about where I plan to camp. Sandwiches, fresh chicken, toasted roll, homegrown tomatoes and onions, mayo, cheese. Ice cold bottle of Lost Coast Tangerine beer. Chips and salsa. Chico Jim drove here with all the fixins. We sit and stuff ourselves, we clean him out. He's ready to pack up when we're done. We are not done. We eat and talk and eat and eat. I won't be making dinner tonight. I'm eating it right now. I have a can of ice cold root beer for dessert. Thanks Jim. You made this a special day. 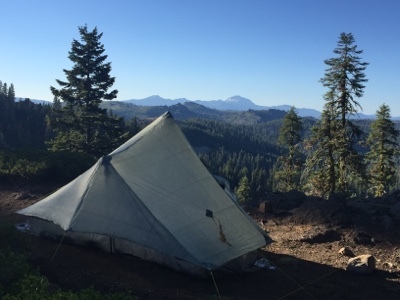 I hike on another hundred yards and setup my tent on the edge of a ridge with a view of Mt Lassen. The ridge has about an inch of dirt on top of rock. I use my boulder guy lines. All the other hikers are continuing on. They are trying to reach highway thirty six so they can resupply in Chester. I'm not doing that. I have enough food to reach my next resupply in Drakesbad. I can camp here. I clean myself off and lay in my tent away from the bugs. I hear a few more hikers go by. They missed Chico Jim. They must have started in Belden today too. They are pressing on to parts more north. I am alone here on my own ridge in a room with an amazing view. You really have a gift of writing Scott. I feel like I am right there with you.